This Soft Gingerbread Cookie recipe makes a batch of traditional Christmas cookies that you can cut out and bake for Christmas dessert! Just a few more days until Thanksgiving and I’m already starting to think about Christmas and all of the Christmas cookies I want to bake this year. I usually spend the weekend after Thanksgiving in the kitchen making dough and assembling all sorts of cookies to give to friends and family during the holidays. 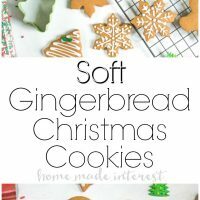 This year I’m adding a few new recipes to my list starting with this Soft Gingerbread Cookie recipe. I’ve already made a test batch and they were perfectly soft and chewy, just the way I like my gingerbread cookies. We’re so excited to be partnering with Wilton today to share some amazing Christmas cookies! All Thoughts and opinions are 100% our own. Christmas cut out cookies are my favorite because I get to pull out a piping bag and get creative with the decorations. I make beautifully decorated cookies for my Christmas parties and as gifts but I always have the most fun closer to Christmas when I get to bake with my niece and nephews. We pull out all of my cookie decorations from Wilton Christmas sprinkles to Wilton Mini Candy Eyeballs and I let the kids go crazy. I’m not sure who loves it more me or them :). 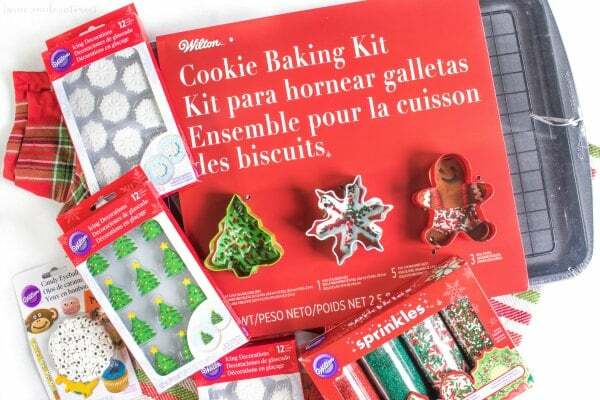 This year, to get my Christmas baking started, I picked up a Wilton Holiday Cookie Value Set at Walmart. It is an 11 piece cooking baking set that includes a large cookie sheet, cooling grid, 5 parchment sheets, 3 metal cookie cutters and red, green and white jimmies. 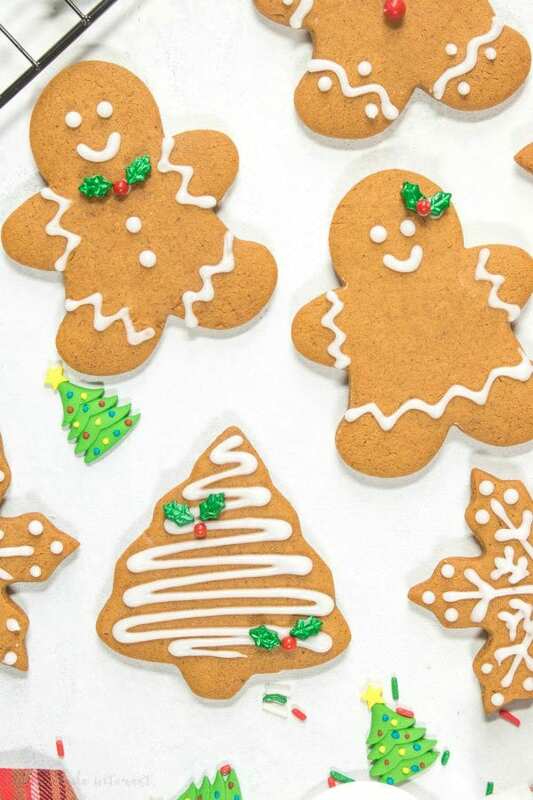 It’s perfect for my new Soft Gingerbread Cookie recipe because the cookies cutters are a Christmas tree, a snowflake, and the classic gingerbread man. 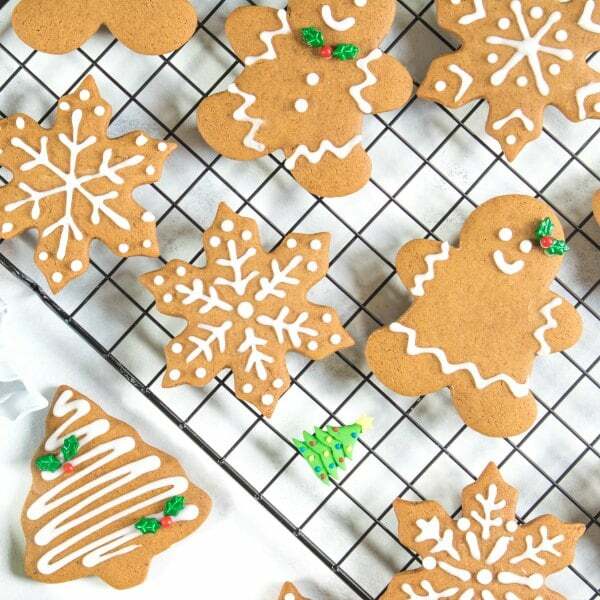 My Soft Gingerbread Cookie recipe works great as a Christmas cut out cookie. I chilled my dough and then rolled it out and used the cookie cutters from my Wilton Holiday Cookie Value Set to cut out my cookies. The dough doesn’t spread at all while it bakes so it holds the cookie cutter shape perfectly. As it bakes dough puffs up slightly and makes this beautifully soft, sweet, spicy gingerbread cookie that I absolutely love! I made a huge batch and kept them in an airtight container and 2 days later when I managed to win the fight for the last cookie it was still just as soft as the day it was baked. I think that makes these great for Christmas because you can make them on Christmas Eve and enjoy them just as much on the day after Christmas. As much as I like baking the decorating is always my favorite part. For my Soft Gingerbread Cookies I made royal icing and piped it on to make perfectly decorated snowflakes, Christmas trees and gingerbread men (and women!). When I let the kids help I usually color the royal icing with Christmas colors and put it in squeeze bottles. Then I let them go to town! Of course their favorite part is the Wilton Christmas Sprinkles and Wilton Mini Candy Eyeballs. I fill up bowls with different colors, shapes, and sizes and the kids have a great time covering their cookies with all sorts of interesting designs. I am a little more refined than the kids with my gingerbread cookie decorating. This year I’m going with a simple white royal icing because I really like how the white stands out against the warm brown of the gingerbread cookies. I pipe my icing on using a Wilton Disposable Decorating Bag and a small Wilton Round Icing Tip and then I add little pops of red and green with some Christmas sprinkles. I am kind of in love with how they turned out. None of it is too fussy or intricate so they were quick and easy to decorate but still pretty enough to serve at my Christmas party and to package up as gifts for friends. 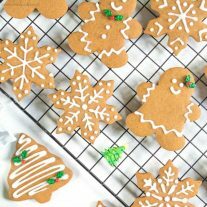 These soft gingerbread cookies are a traditional Christmas cookie recipe that is perfect for the holidays! In the bowl of your mixer add butter and sugar. Cream together until fluffy. Add molasses and egg to the butter mixture and continue mixing until molasses is fully incorporated. In a small bowl whisk together flour, baking soda, ginger, cinnamon, cloves, allspice, and salt. Add the dry ingredients to the mixing bowl 1 cup at a time until the dough comes together and the flour is fully mixed in. Remove dough from the mixer, cut in half, and pat into two disks. Wrap each disk in plastic wrap and chill for 1 hour. Right before dough has finished chilling preheat oven to 350 degrees F.
After an hour remove dough from the refrigerator and roll out to ¼” thickness. Using your cookies cutters cut out your cookies. Place each cut out on a parchment paper lined baking sheet. Press dough scraps back together and roll out again until all of the dough is used. Bake for 8-10 minutes. Or until the edges of your cookies just start to darken. Let cookies cool on a cooling rack. While cookies cool make the royal icing by mixing all of the ingredients in a bowl and whisking until the icing is stiff. You can add water one tablespoon at a time (it won’t take much!) if you would like to thin the icing down for pouring rather than piping. 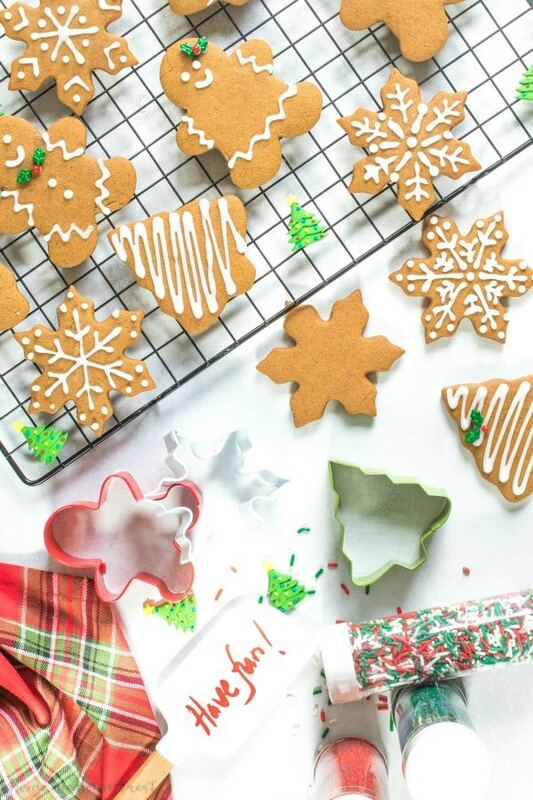 Decorate cookies, let icing firm up and enjoy! Note: You can make this dough ahead of time and wrap tightly in plastic wrap and store in a freezer bag or airtight container in the freezer until you are ready to use. When ready to make cookies thaw the dough in the refrigerator overnight and then proceed with the instructions for rolling and baking. I can use this recipe to make a gingerbread house or houses as well? Yes! This will definitely hold up as a house. Too cute! Great for kids to help. Hi Lori, I’m sorry you had that problem. 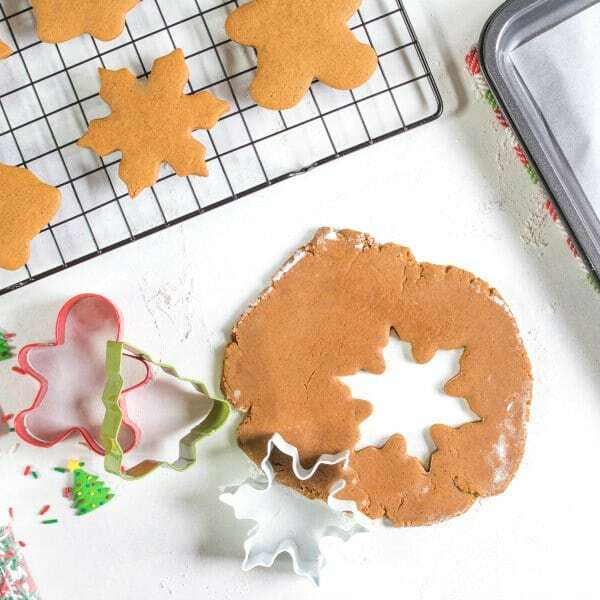 We have made this recipe many times and it was always perfect for rolling out gingerbread shapes. The molasses amount is pretty standard compared to most gingerbread cookie recipes I have seen but I’m sure it isn’t a flavor everyone enjoys. I don’t have any experience with high altitude baking so I can’t say if that could have changed the consistency. Are these to be baked on a greased or ungreased cookie sheet? Hi Linda, we always use parchment paper on our ungreased baking sheets and we find we get the most reliable results that way. The cookies have enough fats in them to release easily from the parchment paper. If you don’t have parchment paper and are using a nonstick sheet pan I would suggest baking them on an ungreased pan. Greasing a pan will often lead to them spreading too much as they bake. Give one batch a test run on ungreased and see how it goes. I highly recommend parchment paper! We made these and have been told over and over again by tasters that they are the best gingerbread cookies they have ever had. I can’t taste test due to gluten allergy, but I can’t believe all of the raves they’ve received. This will be our official gingerbread recipe from here on out! !